Sugar cane root disease in Cuba is reprinted ... from Phytopathology, v.17, no. 2, February, 1927. Zonate foot rot of sugar cane is reprinted ... from Phytopathology, v.17 no. 2, February, 1927. 1927 1350 B Street, S.W. In Journal Economic Entomology, Vol. 19, No. 1, pp. 99-106, 1926. In Annals of Entomological Society of America, Vol. XIX. No. 3, pp. 335-366, September, 1926. In Phytopathology, Vol. 17, No. 2, February, 1927.
does not manifestly involve the above-ground parts of the plant structure. Cuba Sugar Club Experiment Station, Central Baragud, Cuba. reclaim some of this land. any of the considerable number of plantations visited. growing parts at that time. veloped what might well be called a foot rot (at the bases of the stalks). been plugged up, thus preventing the functioning of the root system. 2 FARIS, J. A. Zonate foot rot of sugar cane. PHYTOPATH. 17: 83-94. 1927. Fic;. 3. Bases of caine stalks infected -aith M'Ilanconeurn. unnecessary, as perfect circulation of the steam was secured without it. Sterilization was done under six pounds steam pressure for three hours. series was planted in the same soil sterilized with steam. then planted in pots which were made by cutting gasoline cans in halves. in the provinces of Havana and Matanzas, is also an excellent cane soil. is immediately underlain by coe6. This is ranked as a rather poor cane soil. application of eachaza (filter-press cake). FIG. 5. 1. Plants inoculated with Melanconium sacehari. 2. Check in sterilized soil. TABLE 2.-The effect of inoculating Crystallina cane with Melanconium sacchari. and thus were not capable of infecting the healthy plants in the experiments. of the disease, its effect upon the plants, etc. and stalks. 2. Check, uninoculated. the purpose of this part of the report. important reasons why cane can not be grown to any extent in the Island. with chopped diseased cane roots and stalks. 4. Uninoculated cheek. the country, especially in the Province of Oriente. tions of strangulation have been frequently referred to as victims of root rot. competition with mangrove and salt willow. by the Bureau of Soils in Washington. duction of molasses will result. where deficient drainage alone is a factor. garded as a serious matter. soils so far as the soil types of importance in cane production are concerned. dition of this soil during the dry season. tion, is a most important consideration. is readily apparent and will be discussed further. quently, if the conditions are too rigorous, the roots are certain to decay. fields. Here the stand of cane exhibits varying degrees of degeneration. trouble is frequently referred to as root rot. previous to the closing of the middles. dations can be made in this connection. tion on the red soils of western Cuba was first locally demonstrated. in the first ratoon of an improperly planted and improperly cared for field. in the former stool was 8412 lbs., while that of the inferior stool was 5 lbs. surface of the soil (indicated by the white line) is very bad. infestation of 100 per cent. since been established in Cuban agriculture. taken, after eighth cutting, from burned over area on red soil, Aug. 19, 1925.
pected where it is placed superficially above their normal zone of growth. disregard of the factors here discussed. more likely to be encountered in the older agricultural areas of the West. spect and one or more of the elements becomes unavailable. the cause of local to fairly extensive sabana areas. tant elements necessary in the metabolism of plants. parts of the United States, this problem is receiving considerable study. serious damage than the original wounds inflicted by the insects themselves. possible cyclic or seasonal nature of their appearance in each instance. and the facility with which the infestation by sone of these insects proceeds. by the writers in Cuba. or subsequent encroachment of grass and weeds from the guardarraya. or both, has been frequently referred to as root rot. with decaying rootstocks gave negative results. 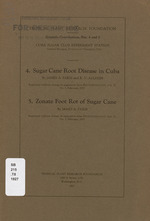 3 RANDs, R. D. Root disease of sugar cano in Louisiana. U. S. Dept. Agr. Cire. and the number of shoots, many of which are dead. Cuba Sugar Club Experiment Station, Central Baragul, Cuba. widely distributed over considerable areas within the immediate localities. provinces of Camagney and Oriente, Cuba. dying plants were surrounded by very strong, vigorously growing cane. FIG. 2. Portion of a hill of cane affected with zonate foot rot. plants were found entirely surrounded by plants dying of this zonate rot. ragged appearance shown in figure 1.
the moisture of the stalk after the root system has ceased functioning. agar, but no organisms have developed. shows the clear surface markings. zonate foot rot. At A is a root in which the cortex has been decayed. that the disease is limited to any great extent by soil type. distinct rings of a blackish brown color upon the rind at that point. at the top the farther they are from the node. formed on the rind of the stalk. wider grayish zone, and this in turn is followed by a brownish red zone. the woody zonated tissue prevented free communication with the stalk. arrow indicates the most advanced zone of infection. graph of sections of four infected stalks. sharp dividing line between the diseased and healthy pith. cylinder appeared to be little affected. and the path of spread of the disease. destruction of the hill in time. infected stubble and progresses through shoots of 2nd, 3rd and 4th rank. to be semi-parasitic and play a secondary role in the injury of the plant. woody, as it is in the case of the zonate rot. to sporadic cases in the young cane, but may become epidemic in a field. In affected plants the young spots on the stalks are a watery red color. the Javan disease by which the affected plants may always be identified. No such spots have been observed in connection with the zonated rot. which has developed a bracket of this Fomcs. by F. pachyphloeus Pat. and F. melanodermus Pat." also show the zonated condition. cane stalk. B. Fomes intimately associated with the zonated parts of the stalk. -monte'' land, that is, immediately after the cutting of the forests. occurs in two widely separated localities in Cuba. and on a porous red soil.